82 minutes from Paris by TGV, at the gates of Germany and Luxembourg, let yourself be surprised! Discover the agglomeration in video! Located in the Amphitheater District of Metz, located at the exit of the TGV station, facing the Pompidou-Metz Center, the Congress Center participates in the economic development of Metz Métropole and the attractiveness of the city. Watch a video of the projectDiscover the Congress Center through a video ! The building hosts a 1200 seat-auditorium, 14 commission rooms from 25 to 400 seats, a 4300m2 section with exhibition areas designed to host up to 200 stands, an internal logistics courtyard, a restaurant and a catering area. September 2018 : opening of the Congress Center. An architectural project, signature of J.M WilmotteThe international architecture agency Wilmotte & Associés Architectes was chosen as part of this Messin project. Jean-Michel Wilmotte is known for his eclectic approach to architecture, for his great attention to detail and quality, particularly in the choice and use of materials. Robert Schuman Metz Congress - how is the site going ? 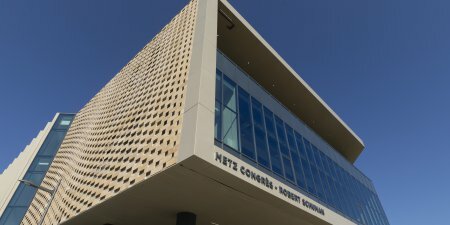 New visit to the site, new opportunity to give you an update on the work of the future Center " Robert Schuman Metz Congress ". Metz, the most beautiful French train station !